The Pharmax Still modular construction offers a wide choice of configurations allowing optimum payback times. Standard models range is from 60 to 22.000 lts/h output. Rapid start up. The distillate is produced after only few minutes from switch on. Energy Savings: the best performance in terms of energy savings, due to an extremely accurate design of the condenser/evaporators and heat recovery system. High Flexibility: the production capacity can be varied by up to 80% without any plant modification. 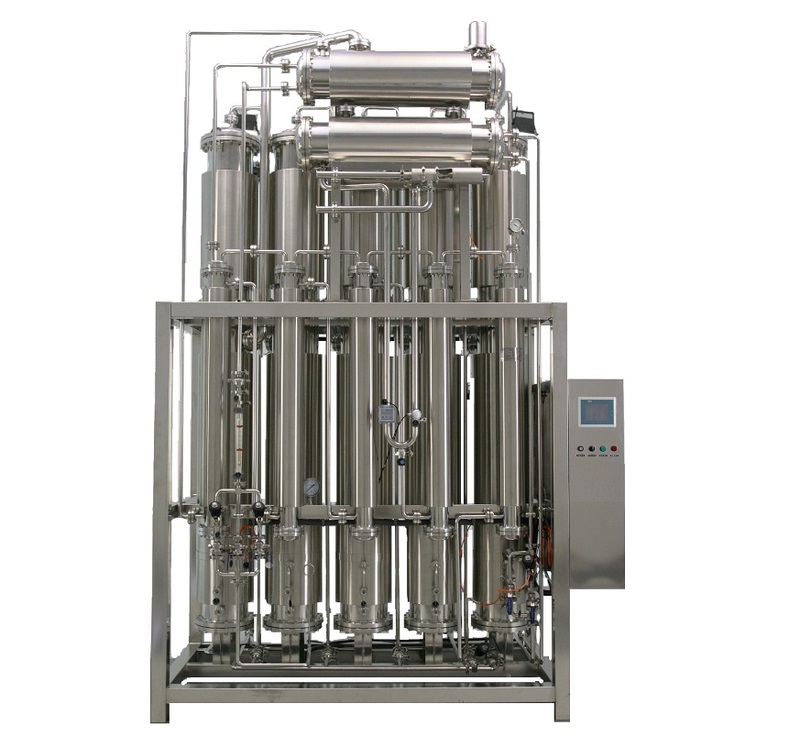 Unique purification system: gravitational purification principle for better guarantee of distillate purity. Simple and clean mechanical construction: baffle free decontamination chamber - no welding. Granting the best inspectability, minimized corrosion risk, for the longest expected life of equipment. Extremely limited maintenance. No moving parts, expansion joints or mechanical seals. Compact construction and low weight. Little extra head room needed for dismounting and inspection. Up to ten effects, for maximum energetical efficiency. The Pharmax Still is based on the “Thin Falling Film” and Multi-stage principles ingeniously combined. The first effect is fed by an external energy source (Industrial Steam or Electrical energy). The pure steam generated in the each effect and the non evaporated water are fed to the subsequent one operating at lower pressure; pure steam is condensed into WFI vaporizing a new portion of feed water. WFI conductivity is continuously measured and, in case of “out of spec”, the produced WFI is automatically discharged to the drain. On line TOC monitoring is also possible. The production capacity can be adjusted in the range of 60-100% by simply acting on the industrial steam pressure. The plant is completely made in AISI 316L stainless steel. Standard finishing of the active surface is pickled and passivated; mirror or electropolishing can be made on request. Product (WFI) contact parts are manufactured with surface finishing 0.6 microns Ra mechanically polished, with piping orbitally welded with sanitary flanges and pharmaceutical grade Teflon gasket. Pre-heaters and exchanger are shell-and-tube type; double tube sheet execution is foreseen where contamination of the distillate is possible. The pipes are expanded into the plates, avoiding any welding for a totally hygienic execution, and a better resistance against dilatation stress. The general construction design, coupled with the described decontamination process, ensure a very high flexibility in equipment layout, together with an extremely limited space needed for maintenance. A unique and careful design of the decontamination chamber allows us to grant the highest performances in terms of endotoxyn content reduction.The gravitational separation system has proven to be an extremely simple and simultaneously effective process for the separation of the contaminants from the pure steam. Challenging the system with increased endotoxin levels in the feed water has proven the capability of Pharmax Still to reduce endotoxyn level by log 6 (1.000.000 times). Pharmax Stills are equipped with effect of unique and original design. Each effect consists of a tube condenser on top and a decontamination chamber below, joined by a flanged connection which also has the function of Support. The column is therefore free to expand without any restraint. The decontamination chamber is a completely empty column without any baffle or mechanical separation device. The decontamination of the steam is obtained by exclusively gravitational separation: the produced steam separates into pure vapour ascending the height of the decontamination chamber at low speed, allowing the impure water droplets to fall to the bottom of the column under simple gravitational force. The contaminants remain thus in the feed water. The heat recovery system in Pharmax Still is the result of a careful mechanical and thermodynamic study. The thin falling film process inside the evaporators/condensers grants the highest efficiency in heat and mass transfer. This process is coupled with the short tubes technology, which ensures the best wettability of the exchange surface.